Alpha-1 antitrypsin deficiency (AATD) is a largely monogenetic disorder associated with a high risk for the development of chronic obstructive pulmonary disease (COPD) and cirrhosis. Intravenous alpha-1 antitrypsin (AAT) therapy has been available for the treatment of individuals with AATD and COPD since the late 1980s. Initial Food and Drug Administration (FDA) approval was granted based on biochemical efficacy. Following its approval, the FDA, scientific community and third-party payers encouraged manufacturers of AAT therapy to determine its clinical efficacy. This task has proved challenging because AATD is a rare, orphan disorder comprised of individuals who are geographically dispersed and infrequently identified. In addition, robust clinical trial outcomes have been lacking until recently. This review provides an update on the evidence for the clinical efficacy of intravenous AAT therapy for patients with AATD-related emphysema. Citation: Brantly ML, Lascano JE, Shahmohammadi A. Intravenous alpha-1 antitrypsin therapy for alpha-1 antitrypsin deficiency: the current state of the evidence. The antitrypsin activity of AAT was first described in the 1950s by Jacobsson.14,15 The protein was later isolated by Laurell and Eriksson in the early 1960s, with some suggestion from case reports that low serum levels in patients were contributing to lung disease.16 Later, AAT was found to inhibit NE with a greater affinity, leading to the introduction of the nomenclature alpha-1 proteinase inhibitor (A1-PI). Since the discovery of a genetic deficiency in AAT, efforts have focused on isolating and purifying the protein from human plasma, in order to supplement patients with a deficiency.3 This has resulted in the development of products (Figure 1) aimed at raising serum levels of AAT in patients with AATD above a theoretical “protective” threshold of 11 µM. This level is equivalent to the 10th percentile of the AAT range of PI*SZ individuals, with epidemiological data suggesting a lower probability of COPD above this level.17,18 Proving the efficacy of exogenous administration of AAT in AATD beyond the biochemical elevation of anti-elastase capacity, i.e., the clinical efficacy to slow emphysema progression, has proved to be more difficult. This has been in part due to the orphan status of the disease and the previously discussed barriers to diagnosis, but has also been confounded by a lack of sensitive clinical study endpoints to monitor disease progression.19 As a result, the treatment of AATD with intravenous AAT therapy has remained a controversial topic and has hampered efforts to raise awareness of the disease. 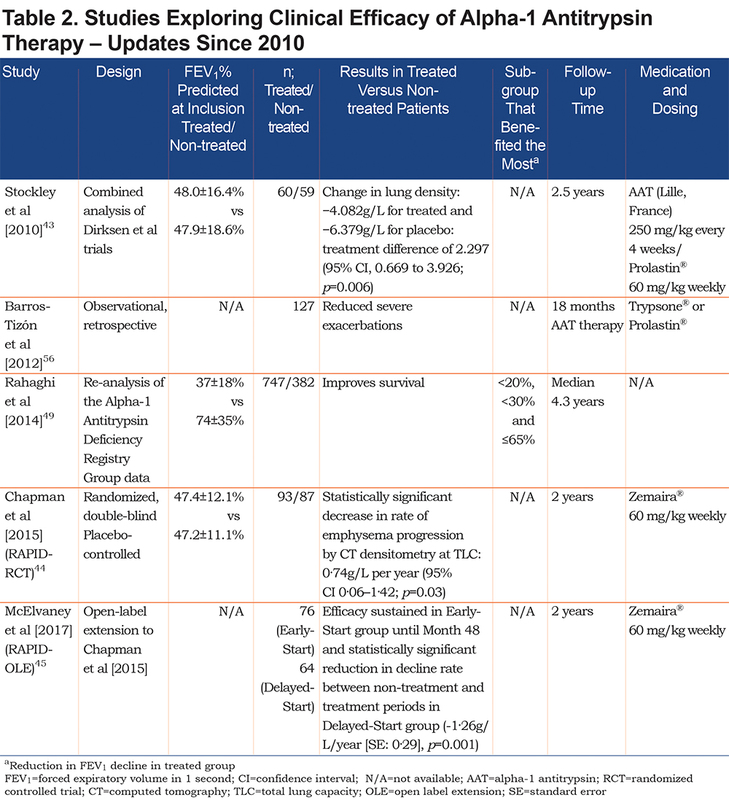 This review aims to update a previous publication by Tonelli and Brantly (2010)2 in light of the publication of data from several recent clinical studies, notably, data from the RAPID clinical trial program – the largest clinical trials of AAT therapy on emphysema progression in AATD completed to date. The present review will focus on and reassess the clinical evidence for the efficacy of exogenous AAT therapy administration to treat patients with emphysema related to severe AATD. The evidence for other clinical uses of AAT therapy will also be covered. For the present narrative review, literature was sourced from the references listed in the Tonelli and Brantly2 paper. PubMed searches were performed to identify clinical trials as well as clinical and pre-clinical studies of AAT therapy published since 2010 that were not included in the original paper. Search terms included: “alpha-1 proteinase/alpha-1 antitrypsin AND emphysema”; “AATD AND clinical trial”. In attempting to demonstrate the clinical efficacy of AAT therapy, various clinical endpoints have been assessed, including spirometry (forced expiratory volume in 1 second [FEV1]), exacerbations, lung density measured by computed tomography (CT), quality of life (QoL) and mortality. The evidence for the efficacy of AAT therapy on these endpoints is discussed below. 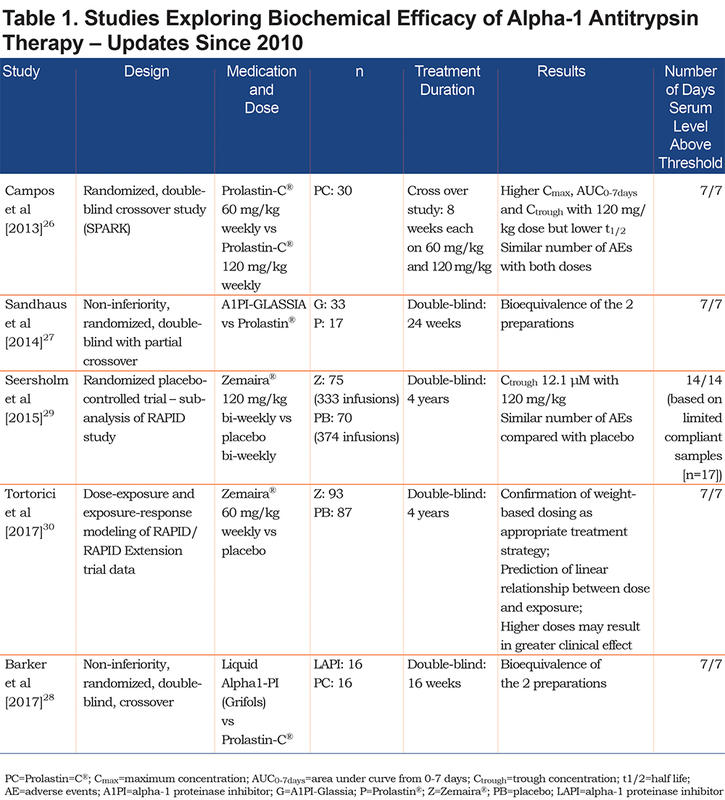 Recent studies published since 2010 that have investigated the clinical efficacy of AAT therapy are shown in Table 2. Despite evidence of a therapeutic effect on FEV1 in observational or registry studies, clinical studies have failed to demonstrate a significant effect, in part due to smaller sample sizes and length of follow-up.37,38 A meta-analysis by Chapman et al (2009) pooled data from 5 studies (N=1509) and concluded that the rate of FEV1 decline was 23% less in patients receiving AAT therapy, with the difference predominantly seen in patients with FEV1 30%–65% predicted.39 No significant effect was shown with values above or below this range. However, as FEV1 has low sensitivity in AATD,38 these data do not rule out the possibility that AAT is effective in more or less advanced disease. Wencker et al (2001) found that the rate of lung function decline may be more important than initial disease severity when attempting to demonstrate treatment efficacy of AAT therapy.34 Contrary to findings from other studies, as described above, statistical significance for AAT treatment versus non-treatment was only reached in patients with baseline FEV1 >65%. However, this was due to the majority of these patients exhibiting very fast FEV1 decline and consequently showing extremely large responses to treatment. This study also highlighted that individual decline in FEV1 can be non-linear. Furthermore, a recent analysis provides further evidence of the insensitivity of FEV1 to detect changes in emphysema progression and AAT treatment effect in AATD40; this will be discussed in more detail later in the review. Overall, although an effect of AAT therapy on spirometric decline has been demonstrated in observational studies, use of this endpoint in clinical trials has been limited due to the need for larger numbers of patients and longer follow-up as indicated by power calculations.19,37 Therefore, endpoints with a higher sensitivity are required to assess the effect of AAT therapy on emphysema progression in AATD. Recently, data from the RAPID clinical trial program, the first adequately powered clinical trial in AATD, were published.44,45 RAPID-RCT was a multi-center, double-blind, placebo controlled trial of AAT therapy that recruited 180 AATD patients from 28 centers worldwide. After 2 years, non-U.S. patients were eligible to participate in an open-label extension phase (RAPID-OLE). During the 2-year extension study, patients who were previously assigned placebo in RAPID-RCT were switched to active treatment. In total, 140 patients (intention-to-treat population: 76 Early-Start and 64 Delayed-Start) continued treatment with AAT therapy, with 121 completing the full 4 years. Recent CT efficacy data also challenge findings from observational studies showing an effect of AAT therapy on spirometric (FEV1) decline at specific levels of baseline disease severity. A regression analysis comparing AAT therapy and placebo in all patients in RAPID-RCT found the treatment advantage with AAT (reduction in lung density decline rate) to be flat across all levels of baseline FEV1 impairment (between 27% and 79% predicted).40 These data suggest that efficacy of AAT therapy is independent of baseline FEV1 and disease severity, although further data are needed to support these findings. The main pathological process in AATD, the degradation of elastin, yields desmosine and isodesmosine (DES/IDES), biomarkers that have been investigated for their potential use in tracking disease progression and treatment efficacy in AATD.51 Previous studies have shown significantly lower levels of DES/IDES in patients receiving AAT therapy compared to patients not receiving treatment.52 Levels were also shown to be significantly higher in AATD patients compared to non-AATD controls, with those receiving AAT therapy statistically closer to normal individuals. The validity of DES/IDES as a biomarker in AATD is supported by a recent publication by Ma et al (2016) concerning the measured level of DES/IDES in patients during the RAPID clinical trial program.53 During RAPID-RCT, the levels of DES/IDES were statistically lower at all time points in the treated group compared with placebo. This effect was maintained in patients who originally received active treatment in RAPID-RCT (the Early-Start group) over the full 4 years of RAPID-RCT and RAPID-OLE. In the Delayed-Start group, switching to active treatment at month 24 was associated with a significant reduction in DES/IDES at months 36 and 48. A weak but significant correlation between changes in DES/IDES and the CT densitometry data at TLC was also shown (R=−0.256, P=0.005). DES/IDES show promise in providing a low-cost estimate of the severity of disease in AATD patients. However, such are the extremely small quantities of DES/IDES involved (in the nanogram per milliliter range) that highly sensitive analytical equipment is required. Further development of an assay for use in clinical trials is therefore necessary. Other clinical endpoints have been investigated in clinical studies of AAT therapy, these include exacerbation frequency/severity and QoL, as assessed by the SGRQ. Lung exacerbations are a significant health care burden in AATD and contribute substantially to poor outcomes and QoL.54 Two observational studies have reported beneficial effects of AAT therapy in reducing exacerbation frequency55,56; Barros-Tizon et al (2012) demonstrated a reduction in all (p<0.05) and severe (p<0.01) exacerbations in a cohort of 127 patients. This was reported to equate to a significant reduction in health expenditure per patient and was more apparent in patients who had previously experienced an exacerbation.56 However, although the cohort of patients were reportedly well-matched socioeconomically, the absence of a control group and the retrospective manner of the investigation are significant limitations. To date, a beneficial effect of AAT therapy on exacerbations has not been confirmed in several clinical trials.37,38,44 However, as AAT has significant anti-inflammatory properties,57 treatment may have a greater impact on exacerbation severity, rather than frequency. The EXACTLE clinical trial studied the effect of AAT therapy on exacerbations and reported an improvement in the qualitative severity of exacerbations following AAT treatment38; however, no specific details of this effect are provided. The effect of AAT therapy on exacerbations in AATD has yet to be confirmed and future clinical trials will have to be appropriately designed to fully investigate this. Answers to the following questions are based on evidence collated within this review, with updates on the 2010 Tonelli and Brantly paper. 1. Why have clinical trials focused on CT lung density rather than mortality? In addition, extrapolation analyses, such as the post-hoc analysis of the RAPID clinical trial program, suggest that AAT treatment may extend the time to a terminal respiratory event (e.g., lung transplantation or death). However, this evidence of a mortality benefit is indirect, and direct mortality data has been highlighted by some as key to supporting clinical efficacy.63 Therefore, further mortality data is needed and long-term terminal lung density data could support the proposed life-extending effect of AAT therapy. 2. Is there now sufficient evidence of clinical efficacy to recommend AAT therapy? 3. Should we expect a significant effect on quality-of-life outcomes? The SGRQ was designed to assess the effect of interventions that improve symptoms in COPD; however, while there is evidence that AAT therapy can slow disease progression, it cannot regain the lung tissue already lost pre-treatment, as demonstrated by the RAPID clinical trial program data.44,45 Moreover, the question of whether AAT therapy has an effect on exacerbations, a significant contributor to poor QoL outcomes, has yet to be conclusively determined. As the treatments and outcomes differ between COPD overall and AATD-related emphysema, there is an argument to be made that a QoL measure specific to AATD is needed to fully assess this question. 4. Is 11 µM the right “protective threshold” below which patients should receive AAT therapy? As discussed previously,2 this target includes the endogenous, functionally deficient protein (in for example PI*ZZ patients) and is a measure of the total antigenic, rather than the active level. Nevertheless, by utilizing the 11 µM threshold as a point of reference, both observational studies and clinical trials (as summarized within this review) have demonstrated that elevating antigenic AAT levels above this level with the 60 mg/kg/wk dose exerts a significant clinical effect. However, to date clinical studies have focused on confirming the efficacy of the standard 60 mg/kg/wk and dose-optimization has yet to be explored. The recent pharmacometric analysis of the RAPID trials by Tortorici et alprovides the first tentative indication that higher doses may yield a greater clinical effect. In the RAPID trials, due to higher body weight and different volumes of distribution, some patients had higher exposure levels of AAT and these patients tended to have greater reductions in the rate of lung density decline.44 When the data were modeled, a linear association between exposure and response (reduction in decline rate) was predicted – suggesting that higher doses may be associated with a greater clinical response.30 The authors, Tortorici et al, acknowledge that it is unlikely for the relationship between exposure and response to be completely linear and that a plateau would be expected. However, the plasma level at which this plateau occurs is likely to be beyond the traditional 11µM threshold,30 which is the target for the 60 mg/kg/wk dose. The potential for greater efficacy on the rate of lung density decline with higher doses prompted the European Medicines Agency to request a post-marketing study following on from the RAPID trials to evaluate the efficacy of both 60 mg/kg/wk and 120 mg/kg/wk doses.65 In addition, another clinical trial of AAT therapy efficacy on lung density with the same high/low dose design was also planned and is now active.31 Moreover, a recently completed small-scale clinical trial provides evidence of increased biological activity with higher doses. The study found that normalizing AAT serum levels in severe AATD patients with doses of 120 mg/kg/wk resulted in a significant reduction in inflammatory markers versus the 60 mg/kg/wk dose.66 However, further research is required to establish whether increased anti-inflammatory activity translates into improved clinical outcomes. Therefore, as clinical evidence for increased efficacy with higher doses is scarce, doses >60 mg/kg/wk are not currently licensed and this is unlikely to change until clinical efficacy and long-term safety are demonstrated in a large-scale clinical trial. 5. What is the correct dosing interval? As summarized within this review, several studies have experimented with extended and individualized dosing intervals. However, only the 60 mg/kg weekly dose has been shown to consistently maintain AAT serum levels above the 11 µM threshold, and serum AAT levels have been shown to decrease below 11 µM 1–2 days prior to the next dose with 120 mg/kg biweekly.21 Despite the previously discussed limitations with the 11 µM threshold, the clinical implications of not consistently raising levels above this threshold are uncertain, as most clinical efficacy data to date are based on the standard 60 mg/kg/wk dose. However, recent data from the RAPID clinical trial program demonstrate that longer dosing intervals may be beneficial in certain situations, e.g., to cover vacations, and importantly, that higher doses are not associated with increased adverse events.29 Nevertheless, due to a lack of clinical efficacy data based on alternative dosing strategies, the standard 60 mg/kg/wk dose should be the mainstay of treatment at the present time. 6. How should patients on AAT therapy be followed? There is a lack of a clear consensus on this issue. 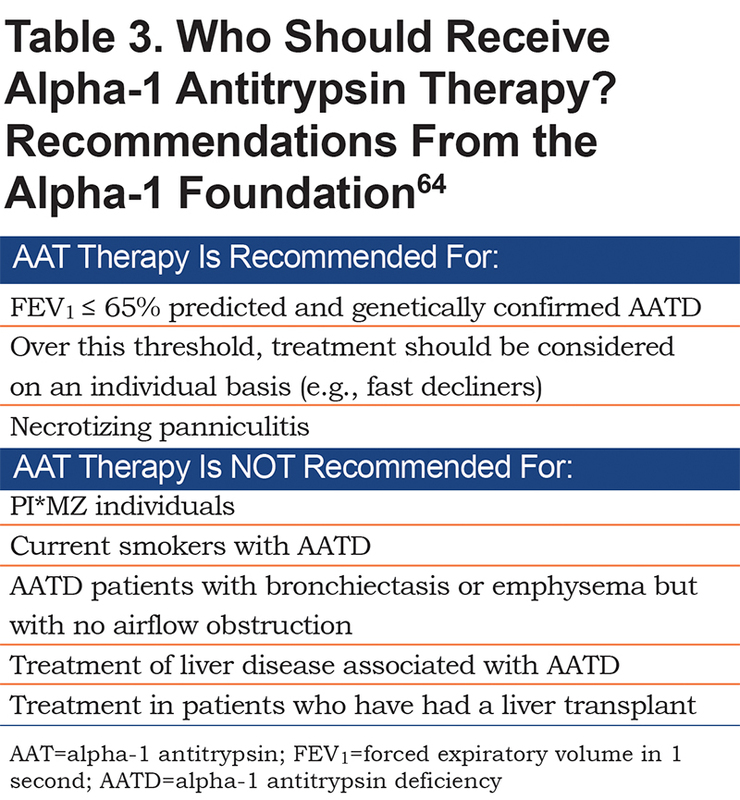 As discussed previously,2 one firm recommendation from the original American Thoracic Society/European Respiratory Society statement is to measure FEV1 on a yearly basis.12 There has previously been limited evidence for tracking AATD disease progression with CT densitometry; however, the RAPID clinical trial program data provide a sound basis to recommend the use of CT densitometry. The recently published Alpha-1 Foundation AATD guidelines provide a firm recommendation that all newly diagnosed, symptomatic AATD patients should have a baseline chest CT scan.64 However, serial chest CT scanning is not recommended owing to radiation dose and uncertainty regarding how exactly the results should be interpreted clinically. This recommendation may change in years to come as lower-radiation scanning is introduced and the value of quantifying the level of disease progression is fully understood. 7. Should individuals with PI*MZ and PI*SZ receive AAT therapy? There is limited rationale for treating patients with intermediate deficiency (i.e., PI*MZ individuals),67 and there is currently no evidence to support this use of AAT therapy – this is reflected by a firm stance in the latest guidelines (Table 3).64 However, if a patient is found to have the PI*MZ genotype, the chance of a direct family member showing homozygosity is significantly higher (owing to Mendelian inheritance).12,64 Therefore, familial testing of PI*MZ individuals is advised. The PI*SZ genotype is considered to be a severe deficiency variant64; however, clinical presentation is highly variable and PI*SZ individuals make up a small percentage (as little as 4%) of the lung pathologies associated with AATD.68 The decision of whether to treat PI*SZ patients therefore remains at the discretion of the treating physician based on AAT serum levels and clinical presentation. Furthermore, in recent years indications for treatment have moved away from narrow ranges of genotypes due to the high heterogeneity of the SERPINA1 gene, demonstrated by the large numbers of novel pathogenic mutations that continue to be discovered. Physicians are therefore encouraged to take a holistic approach and look at all aspects of AATD, from AAT serum levels to lung-function parameters and smoking status. 1. Identifying an average terminal lung density threshold in AATD and emphysema to help quantify treatment-advantage with AAT therapy. 2. Dose optimization: now that the clinical efficacy of AAT therapy in AATD has been demonstrated, efforts should focus on identifying the optimal dosage/dosage interval. 3. Further study is required to confirm efficacy of AAT therapy in both early- and late-stage disease suggested by the RAPID-RCT data. It is pleasing to see significant steps forward in the understanding of AATD. 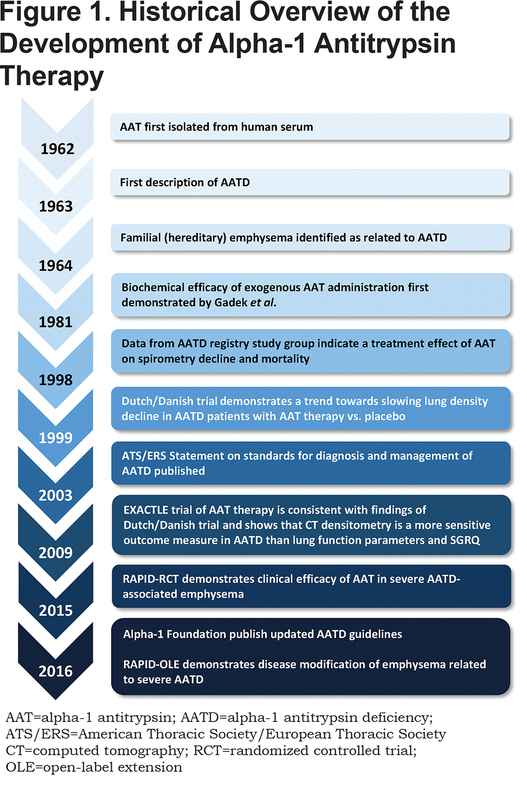 In the 8 years since the publication of the previous review, the RAPID clinical trial program has demonstrated that AAT therapy can significantly reduce lung density decline and is disease modifying. Nevertheless, despite the significant progress there remains doubt among some parties regarding the meaning of CT data and there is work required to conclusively link the reduction in rate of lung density decline to a mortality benefit. While it is difficult to demonstrate a mortality benefit of AAT therapy in a clinical study, data from the RAPID trial program indicate that treatment with AAT may delay the time to terminal lung function. Furthermore, the use of AAT therapy continues to be researched in other therapy areas, particularly in transplant and type-1 diabetes, in part due to its highly positive safety profile. Results from ongoing clinical trials in these areas are eagerly awaited. The authors have no conflicts of interest to declare. Medical writing assistance was provided by Steven Foster of Meridian HealthComms Ltd (Plumley, United Kingdom), funded by CSL Behring. 14. Jacobsson K. Electrophoretic demonstration of two trypsin inhibitors in human blood serum. Scand J Clin Lab Invest. 1953;5(1):97-98. 15. Jacobsson KI. Studies on the determination of fibrinogen in human blood plasma. II. Studies on the trypsin and plasmin inhibitors in human blood serum. Scand J Clin Lab Invest. 1955;7 (Suppl 14):3-102. 35. Chapman KR, Bradi AC, Paterson D, Navickis RJ, Wilkes MM. Slower lung function decline during augmentation therapy in patients with alpha1-antitrypsin deficiency (A1ATD): results from the Canadian AIR Registry. Proc Am Thorac Soc. 2005;2(A808). 42. Food and Drug Administration (FDA),Blood Products Advisory Committee. Clinical and surrogate endpoints for evaluating efficacy of alpha1-proteinase inhibitor (human) augmentation therapy. Wayback Archives website. https://wayback.archive-it.org/7993/20170113022628/http:/www.fda.gov/downloads/AdvisoryCommittees/CommitteesMeetingMaterials/BloodVaccinesandOtherBiologics/BloodProductsAdvisoryCommittee/UCM171091.pdf. Published 2009. Accessed December 2018. 49. Rahaghi F, Monk R, Ramakrishnan V, Strange C. Alpha-1 antitrypsin augmentation improves survival in severely deficient individuals with low lung function. Am J Resp Crit Care Med. 2014;189:A5794. 60. National Institutes of Health. A pilot study of alpha-1-antitrypsin (AAT) in steroid refractory acute graft vs host disease (NCT01700036). ClinicalTrials.gov website. https://clinicaltrials.gov/ct2/show/NCT01700036 Published 2016. Accessed October 2017. 61. National Institutes of Health. Alpha 1 anti-trypsin in treating patients with acute graft-versus-host disease (NCT01523821). ClinicalTrials.gov website. https://clinicaltrials.gov/ct2/show/NCT01523821?term=AAT+alpha-1+proteinase+inhibitor&rank=20. Published 2012. Updated 2018. Accessed October 2017.